Matchwinner Martyn Waghorn broke his goalscoring century as Derby County maintained their promotion push with a 2-0 home win over in-form Hull City. Waghorn, who was moved to a central role up front in place of the injured Jack Marriott, struck the 100th and 101st of his career to take his total for the season to eight for the Rams. 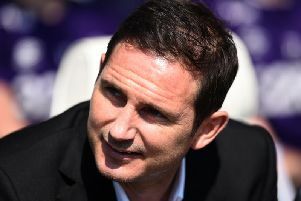 The win stretched Frank Lampard’s side’s unbeaten run to five games and was their third consecutive clean sheet. “I was delighted, it has been a while (since I played a central role),” said Waghorn. “I’ve played out wide a lot, tried my best and given 100 per cent. “I got my chance playing down the middle and hopefully I can keep working hard, keep building on that performance knowing I’m ready to do whatever to win and achieve. I just want to keep working hard and keep getting better. “That’s three clean sheets on the bounce now, which is important in this league. Waghorn’s opener in the 41st minute was a terrific finish after Duane Holmes put the ball through the legs of his marker to Waghorn in the area. Waghorn’s initial shot was beaten away by the Tigers’ keeper, but Wahgorn volleyed the rebound home. “It was brilliant [from Holmes],” Waghorn said. “I thought he was going to chip it over in front, but he managed to drill it through and thankfully I was onside and the rebound fell to me. His second came from good work by teenage full-back Jayden Bogle in the 71st minute, whose pressure paid off by the corner flag. The youngster regained possession and set up Waghorn for a clinical finish. Waghorn added: “That is what we base our game on, winning the ball back high up and they did that in the far corner.